We are planning to launch a small business that will advocate to reduce, if not end the use of plastic. The business is already registered and domain has been purchased. We just need to develop the logo I have in mind, which I drew on a piece of paper. I have zero talent in drawing so please bear with it. 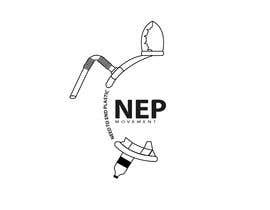 The name of the business is Need to End Plastic Movement or NEP Movement. Our goal is to create awareness about the negative effects of plastic to our environment by creating contents and partnering with environmental orgs. We will also sell or provide products that are alternatives to plastic. The logo I have in mind which I drew is a "turtle", showing just half of the body because the half will be the business name. We want a logo that will represent our advocacy and will instantly remind people why we are doing what we are doing and why they need to support us. We incorporated turtle which is a heavily affected creature by plastic and to remind people of plastic's negative effect to see creatures or turtle, I decided to make its flipper a plastic straw. Also, I made it's hind flipper a plastic bottle. Also, maybe you can incorporate just a trace or bit of the hexagon shapes at the back of the turtle for it to be more recognizable. I also want both the full name of the business which is NEED to END PLASTIC and short version which is NEP to be present as part of branding and for us to be remembered in different ways regardless if we use the long or short version. I made the side of the turtle's case as NEED to END PLASTIC and the shorter version will be the other half of the logo. I also initially thought of doing the turtle case's outline like a black plastic garbage bag. The head is still the head of turtle so it can be recognized right away. That's the idea behind and I need help in developing it to a real logo. I only put $15 for now but I will give at least $35 for the winner. Another idea but PLEASE FEEL FREE TO INSERT YOUR OWN, I was thinking of black and bit fading texture for the turtle side to maybe represent dying or disappearing. For the NEED TO END PLASTIC portion, maybe the N, E and P can be highlighted by using a different color and maybe the word "TO" can be gray so that it's not that visible or not that highlighted. I dont have an idea about the NEP MOVEMENT letters yet but I was thinking maybe incorporating black, blue and other blue palettes on either NEP or MOVEMENT to represent the sea. That's all I have in mind. Feel free to develop if you think it will make the logo better and will reward accordingly. The logo should be able to provoke or hit you emotionally. What I drew is just an idea and you don't have to stick to every part of it if you think you can make it better. Look at your design and if it doesn't encourage you to be concerned to the environment then I think it's not the right one yet. It can be just simple, minimalist but appealing and a bit classy. Just like a normal logo. Lastly, check if its something that you want to represent you if you're part of the business. Sorry. I just attached it.